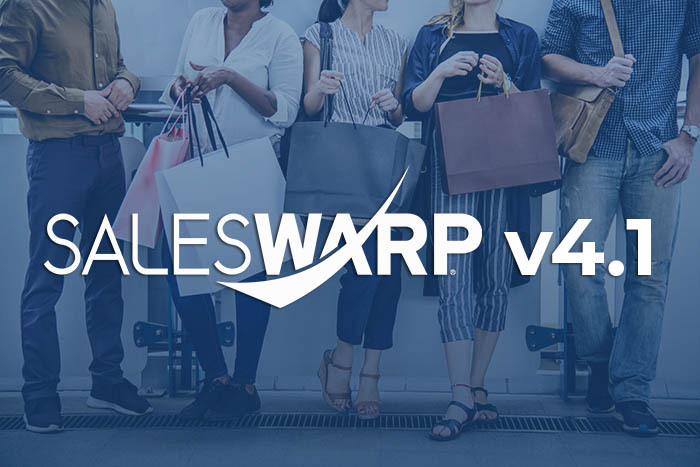 We are excited to launch the latest major series in the SalesWarp family with the release of version 4.1! Our new Series 4 runs faster than ever with more features and flexibility to elevate your sales growth, manage operations, and improve delivery performance. The modular redesign of Series 4 brings a multitude of new features along with improvements to make customizations easier to manage and speed-up future releases. SalesWarp’s Series 3 offered advanced order and inventory management features and used our patented workflow engine to solve a variety of business needs for e-commerce and omnichannel retailers, brands, and other B2B businesses. The Series 4 expands on these features and includes pre-built configurations and workflows for key use cases that will reduce deployment times by 40 to 50%. Our third-party program is expanding in the Series 4 release; allowing third-party developers to extend their integrations with SalesWarp’s API, adding third-party plugins into the SalesWarp platform, and even selling premium plugins and services. Series 4 introduces our most advanced features for handling complex order and fulfillment scenarios. We’ve updated our delivery invoice system and made this a core feature for all users. Combined with our workflow engine, this feature lets you fulfill the most complicated orders with ease. Whether you are shipping from one location or multiple locations worldwide, delivery invoices will make fulfillment and customer service a snap for retailers and B2B businesses alike. Use our advanced order management features with delivery invoice logic to handle multiple shipments from locations, geolocation rules, recurring orders, future shipment dates, B2B and B2C orders, advanced routing logic, lowest shipping cost, fastest shipping times, multiple shipping addresses, pick-up onsite, mixed orders and more. Series 4 has key improvements to make importing and managing orders much faster and effortless. From our automated API connections with Shopify, Magento, BigCommerce, Amazon, Walmart, eBay and others to our order imports, API’s and EDI connections, you’ll be able to centralize all orders, inventory, fulfillment and customer service needs into one solution to help you deliver a superior customer experience. Warehouse operations have received a major tune-up in Series 4, continuing our effort to improve capacity while eliminating errors. Reduce time and complexity with our pick manager tools for wave picking, pick to order and batch picking operations. Continue using your favorite shipping tools or eliminate separate shipping systems by using our fully integrated shipping solution with USPS, FedEx, UPS, DHL, and Aramex. Use location management to show the warehouse location and the bin/cart to pick, granting the ability to locate any order in real-time, whether it’s been picked, packed, or is already shipped. Batch express orders separately and get them out of the door quicker. Use our workflow engine to tune processes, KPI’s and dashboards to optimize your business and profits. Inventory management has become increasingly complex for almost every retailer, brand and B2B business. Series 4 brings a multitude of new inventory rules and workflows to help you manage your diverse inventory, fulfillment and delivery processes. Leverage SalesWarp to get accurate inventory data across all your systems; including ERP, Point of Sale, Accounting, CRM, WMS, and other systems. Manage multiple warehouses, 3PL’s, Amazon FBA and drop shippers to get a single real-time view of inventory across your entire business and supply chain. Avoid overselling and overpaying on shipping costs. Series 4 will help you manage the complexity, velocity and real-time inventory needs of any business. Series 4 is extended for international business and includes enhanced time zone support, international currencies, and languages. Time zone support has been improved for managing orders, reports, KPI’s and other functions based on your location without the hassle of remembering which time zone is used for financial reporting. We’ve also added several supported languages including Arabic, French, and English. Series 4 will now support language translations and currency. SalesWarp Series 4 comes with several pre-built configurations and workflows to improve delivery times by 40 to 50%. Each Series 4 release includes a complete reference design around popular third-party systems such as e-commerce, ERP, or point of sale solutions. Version 4.1 comes pre-packaged for omnichannel retailers and includes a reference design for ‘buy online pick up in store’ (BOPIS), ship from store, endless aisle; plus SalesWarp core OMS, WMS, shipping systems as an integrated solution. The 4.1 reference design integrates Magento 2 and Retail Pro; however other store connectors such as Shopify Plus, BigCommerce, Zoey, and other customized connections are available. Our latest release is now ten times faster than previous versions, ensuring real-time data accuracy and high-speed loading pages. With optimized speed, you’ll be finishing day to day operations in less time! The increased performance also means SalesWarp can handle more complex workflows, AI and real-time calculations. From inventory, routing and shipping logic to complex calculations and forecasting on safety stock and reordering; the increased performance will let you tune operations and profits to the next level. SalesWarp’s new API system was redesigned from the ground up and is now 98 times faster than previous versions. You’ll quickly find ways to use this extra performance to advance your business. Series 4’s optimized speed lets us test the core software in a much faster cycle; leading to better test coverage and quicker releases. These automated tests ensure that SalesWarp will continue to run smoothly as new features and customizations are added. Create endless possibilities with SalesWarp’s API! Integrate your 3rd party or in-house systems to work directly with SalesWarp. Or simply get the data you want, how and when you want it. Series 4 provides a framework for third-party developers who want to expand the features of SalesWarp to our clients. This framework addresses the need for flexibility while maintaining the quality and production readiness of our systems. Clients will be able to choose third-party plugins or manage their own customizations while continuing to have SalesWarp maintain their production cloud environments. Whether you want to change the placement of a feature or build a new payment gateway, SalesWarp’s API and third-party framework will allow you to do it all. If your organization doesn’t have the means to create custom integrations, the SalesWarp team will build customizations on top of the core software to fit your business needs. Learn how SalesWarp’s Series 4 can expand your business, schedule a demo today!